Buckhead Betty ... on a Budget: Crazy Busy Week! Hi Friends! WOW it has been a crazy busy week, so I apologize for the lack of posts on my end! In any case, good game or not, we are set tomorrow from our end with mini Southwestern corn muffins and a great pumpkin dip with gingersnap cookies. Other friends are bringing warm chili, desserts, and more snacks and dips, all perfect to fill us up in the chilly morning air. 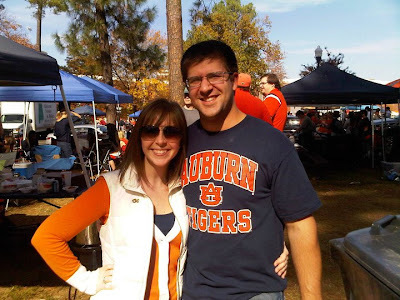 Did I tell you that I swapped into my orange and blue last weekend to be a good Auburn girlfriend out on the Plains? Besides the extreme tailgating that is Auburn football, the whole trip was even sweeter because we got to see our mutual rivals the UGA Bulldogs lose big time to the #2 Tigers. War CAM Eagle. I wish I had a few recipes to share with you here from the Weekly Binder Challenge, but I'd be lying if I said I was a great home-cook this week. Pizza and easy meals took precedence at the end of long days. Life happens, right? I think I should have at least one new find to share with you at the end of next week -- a tasty morning streudel that might be perfect after the big evening meals Thanksgiving weekend brings. So stay tuned: I will post again on Sunday about last weekend's FABULOUS Sugar Coma Festival. What an extraordinary event with over 40 fantastic vendors. I have earmarked my favorite treats from the day, and I can't wait to tell you all about the great companies behind each tasty morsel. In the meantime, have a great Saturday with whatever your plans are for the day. And here's a little snippet from one of my favorite Thanksgiving shows, A Charlie Brown Thanksgiving!